31 Days of De-Stressed Living, Day 30: Zebra Girl! But on zebras, those black-and-white stripes serve a purpose that is most fully realized when the zebras stick together. While no two sets of stripes are exactly alike (stripes on zebras are a bit like fingerprints on humans), when a herd of zebras stand close together, their stripes camouflage the individuals, making it harder for predators to attack. What’s more, when predators do attack, the injured zebra is surrounded by the others, who band together to drive off the predator. 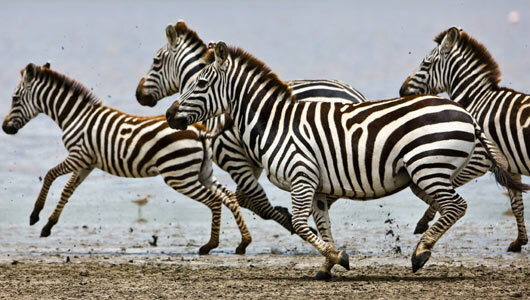 For that reason, zebras do not sleep away from the herd; they depend on the safety of the group. Are we really so different? When God said, “It is not good for man to be alone,” he was pointing to the simple truth that one of the ways we reflect his image and likeness is that we are intrinsically social, designed to be in community with others. For women, it’s especially important to find the society of other women. We are Zebra Girls: Individually, our stripes make us beautiful … yet we are strongest with the support of those whose stripes are like our own. Recently I received a note from an old friend, whose absence from my life has been particularly difficult this past year. I had tried to reach out, tried to reconnect, but something had come between us. In time, I realized I needed to let go — I had to focus my energies on more immediate needs. But seeing her familiar handwriting in the mail, the pang hit again, and I realized just how much I had missed her. Not every friendship is meant to last a lifetime. Some friends pass through our lives like gentle breezes, momentary gifts from the hand of God to fill a pressing need. What my friend taught me, though, is that even lifelong friendships have chapters. Sometimes the zebra steps away — or gets separated — from the herd. But our strength is in our stripes. And our stripes work best when we travel together. Who do you need to call this week, Zebra Girl?